Home › General Info › Look Who’s the New Puppy! Look Who’s the New Puppy! I am the New Puppy in the Bloggersphere. These are my “kids” Fred Astaire (Astaire) and Ginger Rogers (Ginger. 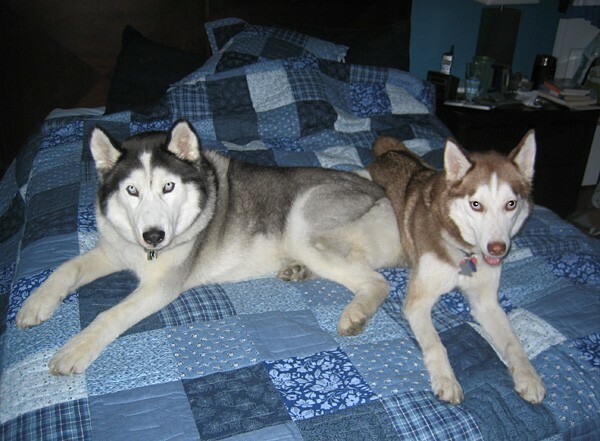 They are rescues from a Siberian Husky specific rescue called Adopt A Husky. I call them the Happy Huskies. I own a Pet Bakery and Dog/Cat supply store in Evanston, IL called the Happy Husky Bakery. I have co-owned this business for a little less than 6 years. This blog will not be a constant commercial for my business but I may have to make reference to it from time to time. I am very excited to be blogging here. I love what I do and happened into this pet care career somewhat by accident. There is a lot to be said for accidents. I expect that this blog will be a very important part of my life. The mission of this blog is to be a place to learn, share and have some fun. This being said I believe we should set just a few ground rules. Comments that demean or seek to cause harm will not be tolerated. These comments will be stricken from my blog. Continued use of profanity will be warned and if it continues. These comments will also be deleted. Fun is a goal here so don’t be too serious about those things that are meant as a joke. I am looking forward to each post as I get to share my experience and passion for all dogs and cats. We will touch on many different topics and some may not even be pet related. Thank you for reading my blog and I hope to make these posts informative and worth your time. Todd, we just learned at the Hike that Astaire had gone to The Bridge in December, and our hearts are with you.